This report draws upon the extensive work the Australian Human Rights Commission has undertaken in the area of Australian law, policy and practice relating to asylum seekers, refugees and immigration detention. The Commission’s work has included conducting national inquiries, examining proposed legislation, monitoring and reporting on immigration detention, and investigating complaints from individuals subject to Australia’s immigration laws and policies. The report considers immigration detention law, policy and practice, bridging visas, the enhanced screening process, third country processing and proposed Government reforms. The Commission acknowledges that there are further policies and programs relating to the experience of asylum seekers and refugees that are beyond the scope of this report. Australia’s key human rights obligations which are relevant to asylum seekers, refugees and people in immigration detention are outlined at Appendix 1. The Commission acknowledges the assistance provided by the Department of Immigration and Border Protection (the Department) in providing information for publication in this report. For over 20 years successive Australian governments have adopted various policies aimed at deterring asylum seekers from arriving by boat. During this period mandatory immigration detention and offshore processing have been key policies in attempts to reduce the number of boat arrivals. A timeline of these policies (as well as other relevant developments) can be found at Appendix 2 of this report. Australia’s mandatory immigration detention system was introduced in 1992. Amendments to the Migration Act 1958 (Cth) (Migration Act) in 1992 required the detention of certain ‘designated persons’ and prevented any judicial review of detention. These amendments did, however, impose a 273 day time limit on immigration detention. In 1994 the mandatory detention regime was expanded to apply to all non-citizens in Australia without a valid visa, and the 273 day time limit was removed. At this time a system of bridging visas was introduced to allow persons to be released from immigration detention in certain circumstances. The next major change in Australia’s policies regarding asylum seekers occurred in 2001, prompted by what became known as the ‘Tampa crisis’. In September 2001 the Australian Government introduced a suite of legislative measures known as the ‘Pacific Solution’. Under this policy, asylum seekers who arrived by boat were transferred to offshore processing centres on Nauru and Manus Island in Papua New Guinea (PNG) where they were detained while their asylum claims were processed. In 2008 the Pacific Solution was dismantled by the Australian Government and the remaining asylum seekers detained on Nauru were resettled in Australia. In September 2012 the Australian Government reinstated third country processing for asylum seekers who arrive unauthorised by boat after 13 August 2012. This followed the release of the report of the Expert Panel on Asylum Seekers, which recommended the re-commencement of regional processing as part of a package of measures to deter asylum seekers from making boat journeys to Australia. After designating Nauru and PNG as ‘regional processing countries’, in September 2012 the Australian Government began transferring asylum seekers to Nauru, and in November 2012 to Manus Island. On 19 July 2013 the Australian Government announced a Regional Settlement Arrangement (RSA) with the Government of PNG. Under the RSA asylum seekers arriving unauthorised by boat after 19 July 2013 will be transferred to PNG for processing and resettlement (if found to be refugees). If found not to be refugees they will be returned to their country of origin or a country where they have a right of residence. On 3 August 2013 the Australian Government also signed a new Memorandum of Understanding with Nauru which provides that the Nauruan Government will enable individuals whom it has determined are in need of international protection to settle in Nauru, ‘subject to agreement between Participants on arrangements and numbers’. In 2012, 17,202 people arrived by boat to Australia. From January 2013 to 30 June 2013 a further 13,108 people arrived. Despite the recent increase in boat arrivals, Australia still receives very small numbers of asylum seekers, by international standards. As at 31 December 2012, there were 45.2 million people in the world who had been forcibly displaced from their homes as a result of persecution, conflict, generalised violence and human rights violations – the highest number in 18 years. During 2012 an average of 23,000 people per day were forced to abandon their homes due to conflict and persecution. The United Nations High Commissioner for Refugees (UNHCR) has reported that at the end of 2012 globally there were 15.4 million refugees. The escalating crisis in Syria was one of the key drivers of the increase in the refugee population in 2012. Last year the conflict in Syria forced 647,000 people to seek refuge in Egypt, Iraq, Jordan, Lebanon, Turkey and other countries in the region. In 2012 Australia received 15,963 applications for asylum, which constituted 2.2% of the total number of applications for asylum submitted worldwide. The number of persons seeking asylum in 2012 equated to less than 7% of Australia’s immigration intake, and 4% of the overall growth in Australia’s population in that year. 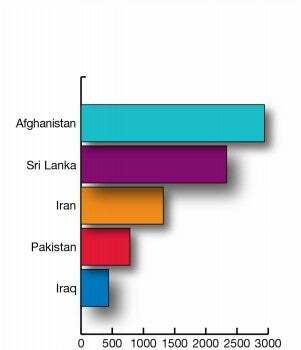 In 2012 the majority of the people who arrived by boat in Australia and lodged asylum applications were from Afghanistan. The top five source countries for asylum seekers who arrived by boat and made asylum applications are displayed in the graph below. Links to all of the Commission’s work in this area, including national inquiries, submissions and reports on immigration detention visits and individual complaints, are available at http://www.humanrights.gov.au/immigration-detention-asylum-seekers-and-refugees (viewed 1 October 2013). Migration Act 1958 (Cth), s 183. See Migration Amendment Act 1992 (Cth), s 3, which inserted (then) s 54Q(2)(b) into the Migration Act 1958 (Cth). See Migration Reform Act 1992 (Cth), s 13. Note that s 2 of the Migration Laws Amendment Act 1993 (Cth) deferred the commencement of certain amendments contained in the Migration Reform Act 1992 (Cth) until 1 September 1994. See Migration Reform Act 1992 (Cth), s 10. For a description of the Tampa crisis see, for example, M Crock, B Saul and A Dastyari, Future Seekers II: Refugees and Irregular Migration in Australia (2006), pp 113-117. See Migration Amendment (Excision from Migration Zone) Act 2001 (Cth) and Migration Amendment (Excision from Migration Zone) (Consequential Provisions) Act 2001 (Cth). A Houston, P Aristotle and M L’Estrange, Report of the Expert Panel on Asylum Seekers, Australian Government (2012). At http://expertpanelonasylumseekers.dpmc.gov.au/report (viewed 1 October 2013). Under the Migration Act certain documents must be tabled with the designations of 'regional processing countries’. Copies of the designation documents tabled by the Minister are available on the Commission’s website at https://www.humanrights.gov.au/transfer-asylum-seekers-third-countries. Regional Resettlement Arrangement between Australia and Papua New Guinea (19 July 2013). At http://www.refworld.org/docid/51f61a504.html (viewed 1 October 2013). See also Memorandum of Understanding between the Government of the Independent State of Papua New Guinea and the Government of Australia, relating to the transfer to, and assessment and settlement in, Papua New Guinea of certain persons, and related issues (6 August 2013). At http://www.dfat.gov.au/geo/png/joint-mou-20130806.html (viewed 1 October 2013). Memorandum of Understanding between the Republic of Nauru and the Commonwealth of Australia, relating to the transfer to and assessment of persons in Nauru, and related issues (3 August 2013). At http://www.dfat.gov.au/issues/people-smuggling-mou.html (viewed 1 October 2013). See J Phillips and H Spinks, Boat arrivals in Australia since 1976, Parliamentary Library Research Paper (updated 23 July 2013), Appendix A. At http://www.aph.gov.au/about_parliament/parliamentary_departments/parliamentary_library/pubs/bn/2012-2013/boatarrivals (viewed 1 October 2013). See Phillips and Spinks, above. United Nations High Commissioner for Refugees (UNHCR), UNHCR Global trends 2012, Displacement: The New 21st Century Challenge (19 June 2013), p 3. At http://unhcr.org/globaltrendsjune2013/ (viewed 1 October 2013). Department of Immigration and Citizenship, Asylum statistics – Australia, Quarterly tables – March Quarter 2013 (2013), p 1. At http://www.immi.gov.au/media/publications/statistics/asylum/ (viewed 1 October 2013). UNHCR, UNHCR Global trends 2012, note 14, p 3. Australian Bureau of Statistics, 3101.0 – Australian Demographic Statistics, Dec 2012. At http://www.abs.gov.au/AUSSTATS/abs@.nsf/allprimarymainfeatures/7B8C452A1CDFAB9FCA257BF100136758?opendocument (viewed 1 October 2013). Department of Immigration and Citizenship, Asylum statistics – Australia, note 18, p 10. This table is based on the statistics from Department of Immigration and Citizenship, Asylum statistics – Australia, above.